CARACAS, March 9 (AFP) -Venezuela’s acting President Nicolas Maduro, who loyally served Hugo Chavez for years, has vowed to keep his mentor’s socialist revolution alive as he tries to fill the void left by the towering leftist leader.�Maduro’s staying power will be tested soon, with an election looming within 30 days after he was sworn-in to office in controversial fashion Friday, with the opposition boycotting the event because it deemed it unconstitutional. The former bus driver and union activist began adopting the role even before Chavez’s death, sounding more and more like him with bombastic speeches against capitalism, the US “empire” and the “parasitic bourgeoisie.”Maduro, 50, gave Chavez a rousing eulogy at his state funeral on Friday, standing in front of his flag-covered coffin, vowing that he would remain “loyal beyond death” to the man whose revolution delighted the poor and infuriated the rich. 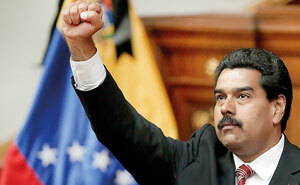 He was considered a moderate and pragmatic member of Chavez’s inner-circle who honed his diplomatic skills when he was foreign minister for six years, but he has taken a hardline tone in recent weeks.�With broad shoulders and a thick mustache, Maduro is an imposing figure who has railed against the opposition for weeks, deriding his likely rival Henrique Capriles as the “decadent prince of the bourgeoisie.”The government and the opposition have been gearing up for the election well before Chavez lost his battle with cancer on Tuesday at age 58, with the type of mudslinging fit for a campaign. After a lull during Chavez’s extended farewell, the two sides resumed their war of words hours after his state funeral ended.�“Nicolas, nobody elected you president. The people didn’t vote for you, kid,” Capriles said, denouncing Maduro’s inauguration as “fraudulent.”Chavez named Maduro, his vice president, as his successor two days before he flew to Cuba in December for the fourth round of cancer surgery in 18 months, urging Venezuelans to elect Maduro if he never returned.